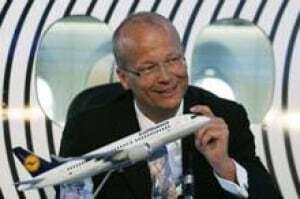 Feb. 13, 2015, c. Leeham Co.: The appointment of Alain Bellemare as president and chief executive officer of Bombardier is viewed positively by the largest and most influential customer for the slow-selling CSeries, Lufthansa Airlines Group. Nico Buchholz, EVP Fleet Management, Lufthansa Group. Lufthansa has a firm order for 30 CSeries and options for 30 more. The Group’s subsidiary, Swiss, is to get the firm orders. The market anticipates that the Group could eventually exercise options for its other subsidiaries. Nico Buchholz, executive vice president for fleet management for the Group, told Leeham News and Comment today that he has worked with Bellemare as a supplier-customer for years in his previous position as an executive of Pratt & Whitney. “He knows what it takes to do deals on engines and aircraft due to his previous experience,” Buchholz said. PW provides the Geared Turbo Fan engines for both airplanes and for the CSeries. “He knows what needs to be done. I think Alain will have ability to get deals done [for CSeries]. Bombardier has firm orders and commitments for nearly 600 CSeries. It reports 243 firm orders, but many of these are soft. Republic Airways Holdings has orders and options for 80, but a changing business plan makes it unlikely Republic will ultimately take delivery, market sources say, and Republic’s CEO has indicated as much. A large order has been placed by Russia’s Ilyushin Finance Corp., but the international political standing of Russia and sanctions placed on the country, including by Canada, cast a spell over these. Several other customers are start-up airlines or those with dodgy finances. This makes Lufthansa Group a company that the industry is watching closely for its orders. Lufthansa has previously said Swiss won’t be the launch operator and Bombardier, while claiming there is one, so far refuses to disclose who it is. BBD has also come under intense scrutiny for slow sales of the CSeries, which has led to a revolving door in its Aerospace division leadership and sales and marketing. This casts further doubt over the CSeries program, which coupled with two years of delays and a stubbornness on pricing and financial terms and conditions, combined to stall sales. Other factors outside Bombardier’s control also have adversely affected sales. Questioned further Buchholz said he believes Bellemare would not have taken the new job if he didn’t receive assurances that he would be able to obtain the freedom to address the market adequately to sell the CSeries. Pierre Beaudoin, grandson of Bombardier’s founder, relinquished the CEO title and moved up to executive chairman with the recruitment of Bellemare. This is reminiscent of Bill Ford giving up the CEO title at the Ford Motor Co. and bringing in Alan Mulally from Boeing to save Ford. Several people give Beaudoin lots of credit for doing what needed to be done. It is widely thought that sales, marketing and communications are priorities that need Bellemare’s attention. Bellemare, who assumed his duties today, said in the Thursday earnings call that included his appointment, will spend the next days and weeks diving into the company. BBD has an investors’ day next month at which analysts—and the industry—will be closely watching for Bellemare’s first moves to turn the ailing company around. The Paris Air Show in June is a mere four months away. The stakeholders will be watching whether Bombardier will have any orders or at least commitments for the CSeries or even whether the airplane will make an appearance. Beaudoin dodged this issue on the earnings call. While orders for the CSeries at or before the show are possible, one that would move the market seems unlikely, according to one well-placed observer. Time is too short to make a big score beyond perhaps a Letter of Intent or Memorandum of Understanding. Landing a firm, binding contract for a large order from a major customer is probably too complex to complete by then. But Bellemare’s first 100 days, an often used unofficial benchmark for turnaround situations, will be closely watched. How Bellemare addresses the personnel and structural issues at BBD as a company and Aerospace in particular will be key indicators of the company this year and beyond. Some of the delays with the CS series have been because of their outsourcing of the fuselage construction to China. Shades of Boeings problems with 787 outsourcing. Rule one: building major parts of a new airliner is not where you indroduce new players into the game. China is not a new player for Bombardier as it has been assembling fuselage sections for other programmes ever since BBD transferred production from Japan. And besides, BBD had a well organized contingency plan to support its Chinese partner which was struggling at the time with the new technology brought in by Bombardier. Large cohorts of Chinese engineers were trained in Montréal to learn the high-tech computer programmes that BBD is using across its own production facilities and in conjunction with all its other structural suppliers. Most of the delays actually came from American suppliers. The reason is simply that the vast majority of the suppliers on the CSeries are well established American companies. The initial difficulties experienced at the Chinese production facility had little impact of the progression of the CSeries. Specifically, which delays were caused bu US suppliers? Mainly the software that drives the Fly-By-Wire system of the aircraft. We are talking here of millions of lines of code that have to be coordinated to fly the plane without a glitch. Large companies like Boeing and Airbus do it internally. Embraer also decided recently to do it in-house to prevent the kind of problems Bombardier experienced on the CSeries. The other problem was with the engine. There was a design flaw in the oil cooling system and one engine exploded on the ground while performing a test. In both cases it took several months to solve the problems. It took almost four months to fix the engine and considerably more for the software. There was not much Bombardier could have done to alleviate, let alone prevent, these problems. Of course Chinese manufacturing is as up to western standards, but I understand its paper trail wasnt. Why else would the fuselage be moved back to Belfast for the certification process. There were other difficulties, as described, in leading edge engineering such as flight control code and the engines. But alloy fuselages ? Some one let the side down in a routine area. Similar case to the TP400 FADEC Software. to not hear little whispers of “enemy action”. As a former decade long employee of BBD Montreal I can disagree with you on blaming the US supply chain and shielding BBD. I personally experienced the style and pace to which my coworkers performed. There was lack of motivation and positive spirit that sapped any momentum we may have had. A lot of passing the buck and just collecting a fat paycheck mentality in the entire structure by both the white and blue collar players. We were perpetually behind schedule. I have observed your comments in this forum and have concluded they are very pro BBD no matter what. I agree with you that my comments are generally pro BBD. But not “no matter what”. My posts are often a reaction to other people’s comments that invariably blame Bombardier for “pour execution” or “mismanagement” without providing evidence for it other than saying that the programme is late or there is a lack of orders. And more often than not they will say that without really knowing what the words pour execution and mismanagement really mean. Personally I was ready to blame the previous CEO for mismanagement of the high level staff under him when he finally hired someone else to replace him as he was himself “called” to replace his father as Chairman of the Board, like Bill Ford had done before him under similar circumstances. It shouldn’t be too hard for the new CEO to do better than his predecessor in terms of high level HR management. On the other hand I should mention that Pierre Beaudoin was an excellent labour relations negotiator. I know at least one very large aerospace manufacturer where this is still a huge problem. It is quite obvious that Sales and Marketing is severely deficient at BBD and I have always recognized that while hoping that the right people would eventually be hired to give a new impetus to the Commercial Aircraft division. But unfortunately this will not be possible, nor desirable, for as long as the HR problem I have mentioned above still exists. It is, or was until last Thursday, the most urgent problem to solve at Bombardier. I have often said here that the CSeries programme was extremely well managed and I have evidence for it: Rob Dewar has been in charge of the programme almost from inception. Now, does anyone here believe that he would still be around after seven years if the CSeries programme was mismanaged or suffered from pour execution? And if Bombardier as a whole was mismanaged does anyone think that BBD would still be the largest train manufacturer in the world? or the the third largest aircraft manufacturer? or the number one Business Aircraft manufacturer? The answer is no. It could always be argued that the son benefited from the guidance of his father. Sure, but this does not change the fact that BBD is a very well managed corporation. Some detractors will say that if it was so well managed the stock would not be at an all time low. Good point. But there is a very simple explanation for that. The CSeries is late and will be burning cash at an alarming rate until the first airplanes are delivered to the customers. And you don’t need to be a Chartered Accountant to figure that out. But don’t count on me to blame Bombardier for having bet the company on the CSeries. Any cognizant observer or analyst will acknowledge that it was the right decision. And for that we can thank the visionary Laurent Beaudoin who brought almost singlehandedly Bombardier to the enviable position it enjoys today in the world of transportation. “Pierre Beaudoin, grandson of Bombardier’s founder, relinquished the CEO title and moved up to executive chairman with the recruitment of Bellemare. This is reminiscent of Bill Ford giving up the CEO title at the Ford Motor Co. and bringing in Alan Mulally from Boeing to save Ford.” That is the first thing that crossed my mind when I learned the news yesterday. And earlier today I actually asked myself if Pierre Beaudoin had read “American Icon: Alan Mulally and the Fight to Save Ford Motor Company”. What Bombardier needs most right now is a large order for the CSeries from a Chinese airline. I have the impression that Beaudoin is going to concentrate on that in the coming months as he tries to convince Chinese investors to put money in the company. One last thing. I am a bit worried about FTV5. BBD said yesterday that it would fly before the end of the first quarter. The same thing was said for FTV7, the first CS300. But the latter has already been handed over to Flight Testing. FTV5 is still with FAL. As far as I can tell it was assembled a while ago and it was scheduled to fly before the end of 2014. This means it is almost two months behind schedule. I don’t know what is holding it up but if it continues like this FTV7 will be in the air first. Which brings me to the A320neo. Airbus said it would enter service (EIS) before the end of 2015. This makes me believe the unthinkable: The A320neo will fly customers before the CS100! There is one important thing to keep in mind: Pierre Beaudoin remains in command of strategy and funding. For the future of Bombardier, it must become a major player in the consolidation of the railway sector, preferably with Siemens. A merger or joint venture remains virtually the only solution. On this side, Bombardier will not only strengthen its potential for research and development to compete with the Chinese, but will add confidence and stability in the production of financial flows. The trains are part of the DNA of Bombardier. Never Bombardier will dispose completely of this division. Otherwise, Bellemare has to sell AND develop the CSeries with new models. I think the next two billion investments are not only meant to supplement funding for Global 7000 and 8000, but also to fund further work towards a CS500. It is clear that Bombardier can not do without such aircraft in its offer. After the CS100 and CS300 certification is the best time to launch this latest model with or without a Chinese partner. Sooner or later, Bombardier will have to face this reality. But how ? This is an aviation forum, but I have to mention that a merger with Siemens would create a virtual monopoly and the European Competition authorities would not approve the deal. Bombardier can still cooperate with Siemens on specific projects as it currently does with Alstom for example. Pierre Beaudoin does — or Laurent Beaudoin does? Personally I suspect it’s the latter. Pierre replaced his father as Chairman of the Board but his new title is different as he has been appointed Executive Chairman. This means he will be more directly involved in the day to day management of the company than Laurent was. He will be specifically responsible of Merger and Acquisition (M&A) and Financing. His short term mandate appears to be to convince the Chinese to invest in BBD and to acquire more Q400, CRJ and CSeries. What do you mean by “convince the Chinese to invest in BBD”? Do you mean buying shares, or taking part of a new bond issue? What would be the impact of such an investment on the competition between Bombardier Transportation and Chinese manufacturers? As for the Chinese buying more regional airplanes from BBD, I remember reading that there is currently a stiff import duty that is applied by China on these aircraft. If the Chinese buy a share of BBD it will dilute the stock, which is the last thing it needs right now. Participation in a bound issue would be more viable in my opinion. In other words to buy debts instead of buying shares. But I am not a financial expert, so take whatever I say with a grain of salt. I remain confident in the future of Bombardier Transportation in China as Bombardier started to develop ties with the Chinese a long time ago. BBD remains today a well establish player in China. And the appointment of Pierre Beaudoin as Executive Chairman will allow him to focus his attention on that market more than ever. China is particularly interesting for Bombardier because it is developing its railways network at a rapid pace and BBD happens to be the largest train manufacturer. It is also building numerous new airports everywhere in the country and those airports will need to be interconnected with small commercial aircraft like the Q400, CRJ and CSeries. And the business aircraft sector recently opened up and appears to be extremely promising for BBD which remains the most dominant player in that field. As for import taxes we have to remember that BBD had the same problem with Russia. But recently the latter changed its policy and that is why BBD is now selling more aircraft directly in Russia. Before that Russians were buying BBD aircraft and had to register them in other countries in Europe to avoid paying import taxes. I imagine the Chinese will eventually do the same. The Chinese market is potentially the largest in the world but it is also very competitive as the Chinese understandably want to develop their own capabilities. So lots of huddles remain for BBD and that is why Pierre Beaudoin will have to focus his attention on China in the coming months. But everything is in place over there for Bombardier to succeed, sooner or later. I personally believe there are many underlying problems with this program that are not publicized instead they always paint a rosy positive image when the results speak otherwise. I don’t see a very good conclusion and I wouldn’t be surprised if they sell the Cseries to the highest bidder or worst case scenario file for bankruptcy protection. Could you elaborate on those problems (apart from employee morale), as most of us don’t have the insider knowledge? I fail to see how Mr Bellemare will succesfully steer Bombardier in this difficult time when others including Scott and Fuller who had impressive résumés couldn’t in better times. What puzzles me is with all its game changing attributes the market hasn’t spoken positively for the Cseries. Scott and Fuller had something in common: They both elected to live in United States long after being hired by Bombardier. I can understand that they wanted to pay less income tax and that they had children in school, or whatever. But this not indicate total dedication to the company like required at that level. When you really want something you will make the necessary sacrifices. That being said I might have done the same thing if I had been in their position. A high executive seat is an ejection seat with the safety pins removed and a golden parachute tu ensure a smooth landing.